Embattled Malaysian Prime Minister Najib Razak poured scorn on a huge two-day rally that brought together tens of thousands of yellow-shirted protesters demanding his resignation over a financial scandal. Large crowds of protesters camped overnight on the streets of Kuala Lumpur wearing yellow shirts of the Bersih movement — a coalition for clean and fair elections — even after authorities blocked the organizer's website and banned yellow attire and the group's logo. Former Prime Minister Mahathir Mohamad, who has been spearheading calls for Najib's resignation, appeared at the rally with his wife for a second day, telling protesters that people power was needed to remove Najib and return the rule of law. Najib has been fighting for political survival after leaked documents in July showed he received some $700 million in his private accounts from entities linked to indebted state fund 1MDB. He later said the money was a donation from the Middle East and fired his critical deputy, four other Cabinet members and the attorney general investigating him. 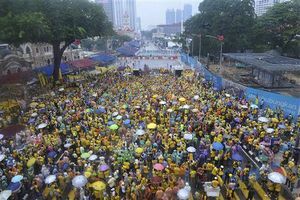 Police estimated the crowd size at 35,000, but Bersih says it swelled to 300,000 on Sunday from 200,000 on Saturday. Najib has slammed the protests for tarnishing Malaysia's image and dismissed their size. "What is 20,000? We can gather hundreds of thousands," he was quoted as saying by local media at a rural event in a northern state. "The rest of the Malaysian population is with the government." In his National Day message late Sunday, Najib said the government rejected street protests, saying they can disrupt public order and not the right way to show unhappiness in a democratic country. They "reflected a shallow mind and poor national spirit," he said. Najib vowed not to bow to pressure. "Once the sails have been set, once the anchor has been raised, the captain and his crew would never change course," he said. The rally was peaceful Saturday and lasted until midnight Sunday to usher in Malaysia's 58th National Day. He said he was aware that the rally will not bring change overnight, but he wants to be "part of efforts to build a new Malaysia." Some used colored chalk to scrawl their demands on the street, writing slogans such as, "We want change," and "We want clean and fair (elections)." Scores of police barricaded roads leading to the Independence Square, a national landmark that authorities declared off-limits to protesters. Two previous Bersih rallies, in 2011 and 2012, were dispersed by police using tear gas and water cannons. Analysts said the rally attracted a largely urban crowd with a smaller participation of ethnic Malays, which could be the reason why the Najib government allowed it to go on. "They feel safe because it has not really affected the rural Malay segment, their bedrock support," said political analyst Ibrahim Suffian. However, he said this doesn't mean that rural Malays are happy with the government, as many are upset with the plunging currency and economic slowdown. A nation of 30 million, Malaysia is predominantly Malay Muslim with significant Chinese and Indian minorities. Its ambitions to rise from a middle income to a developed nation this decade have been stymied by slow-paced reforms and Najib's increasing authoritarianism. Support for Najib's National Front has eroded in the last two general elections. It won in 2013, but lost the popular vote for the first time to an opposition alliance. Concerns over the political scandal partly contributed to the Malaysian currency plunging to a 17-year low earlier this month. In his speech, Najib rejected fears that the economy is crumbling. "It is clearly proven that Malaysia is not a failed state, as alleged, nor is it about to become bankrupt," he said. "On the contrary, the fact is we are stable, with strong fundamentals and will continue to survive and remain competitive." Apart from Najib's resignation, the demands being sought are institutional reforms that will make the government more transparent and accountable.